Hello!! 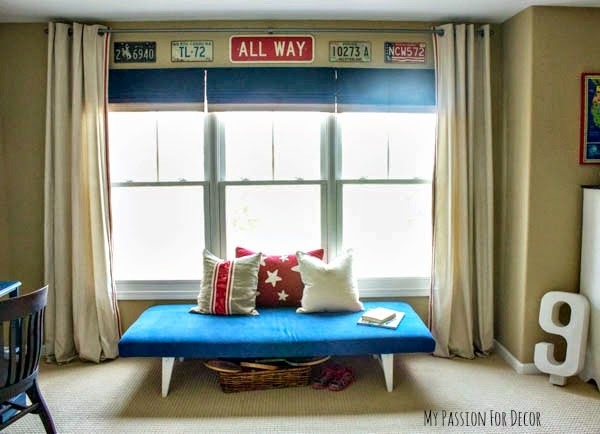 Today I'm sharing some of Hunter's room and how I decorated it without breaking the bank. Also, I'm sharing a bit about Hunter and how he's our miracle child. Ever since I was young, I knew I wanted to be a Mom. I'm adopted and my Mom got pregnant when I was 14. It was after my brother, Bryan was born that I knew I wanted to have children of my own. That feeling of being needed and the overwhelming love was something I wanted in my life. However, when I got married and tried to have children, I became aware that this might not be as easy as I thought. I had a very difficult time getting pregnant. I had some issues that made it near impossible to get pregnant. I tried many types of fertility methods and medications, but with no success. Finally, when I turned 34 I found out I was pregnant! It couldn't have come at a better time. My Mom had been battling cancer for years and was beginning to lose her battle. She was so happy when I told her I was pregnant. However, my joy quickly turned to grief when I found out the pregnancy was ectopic and would need to be surgically removed. My family was devastated and I felt so much overwhelming sadness, loss and guilt. I must have done something wrong to have this happen...or so I thought. After my procedure, my doctor told me I wouldn't have children. My age, other infertility issues and now a damaged filopian tube made having a baby an impossibility. She spouted off a bunch of statistics and facts about my situation. I grieved at the loss of my dream and the loss of my baby. About 6 months later, my Mom lost her long battle with cancer. It was a very sad time, but it was good to know she was no longer in pain or suffering. I was sad because I knew how much my Mom had wanted a grandchild and now she would never have that chance. Although, in my heart I knew she was in a better place and I felt the baby we had lost would be there with her. My hubby and I lived our lives and resigned ourselves to the fact we wouldn't be able to have a child. I was finally OK with the idea and actually started to embrace my child-free lifestyle. During an extremely stressful time in our lives, one of the hardest times ever, we found out I was pregnant. I rushed to get an ultrasound, fearing the worst...another ectopic pregnancy, but it was a miracle!! The baby was right where it needed to be and everything was great. After my appointment, as I walked backed to my office, I realized things were about to change in a big way. I was overwhelmed with emotions, I was scared, thankful and full of excitement. It was then that it struck me how only 8 shorts months ago my Mom had passed away and somehow I knew and felt in my heart she must have had something to do with this miracle. I was going to be a Mother even when the doctors said it wasn't possible. 8 months later Hunter was born. It was the best day of my life seeing his head full of blond hair and blue eyes for the first time. Immediately, he gave me something I never thought I would have....an actual blood relative! I was adopted at 3 days old and I had lived my life never knowing anyone that looked like me or was actually related to me by blood. Hunter looked just like me and even had my dimple chin. That day forever changed my life and gave me a purpose and direction I'd never had before. Now Hunter is 9 years old, going on 25, and way too smart for his own good. He makes me laugh every day. He's encouraging, surprising, full of information and facts and fills my heart with such a deep love every times I look into his eyes, it's overwhelming and takes my breath away. I've never knew such happiness or unconditional love until he came into my life. Yes, yes, I know this is a DIY, home decor blog and I'm getting to that part I promise. 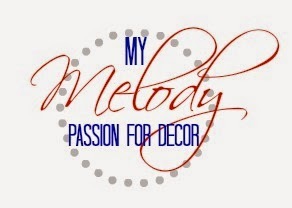 I just felt I needed to write about why decorating and designing rooms and furniture for him makes me so happy. I really never thought I would get the chance to do this! Now every time I have the opportunity to make a room special for him, it means the world to me. When we moved into our new house at the end of April, I had a plan for Hunter's room. I'm still not completely done, but I'm slowly making progress. 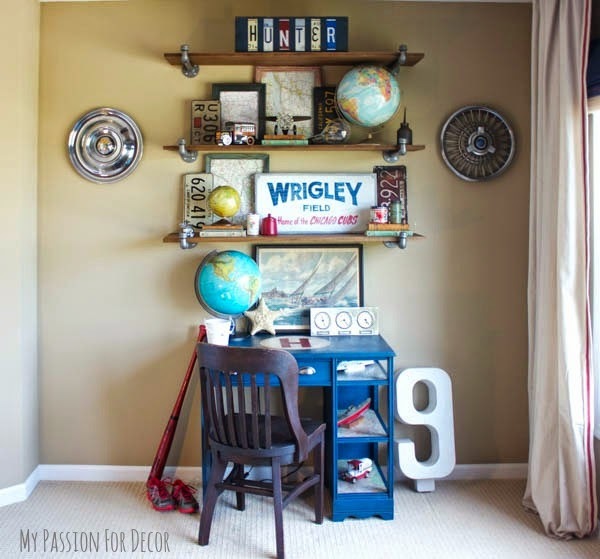 My goal for his room is to make it a room that will grow with him, show his personality and not cost a fortune. I wanted to share some pictures of what I've done so far in his room and how you can decorate a room for your child without breaking the bank! Hunter is the typical boy, he loves sports, cars, motorcycles and planes. He also loves to travel. Over the years, I've been incorporating all of his 'loves' in his room. The first place I started in this new room was shelving. Hunter's room is big and has a very nice tray ceiling (something else I have plans for!). He needed a place to nicely display his 'things'. 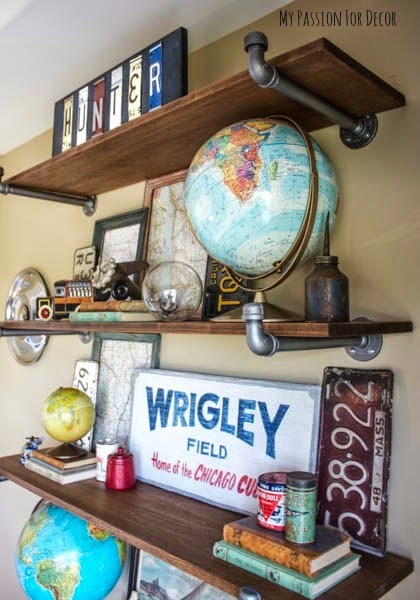 After building my DIY pipe shelving for my kitchen, I thought it would be a great idea to do something similar, but instead of a free standing unit, attach the shelving to the wall. I had seen this done on Pinterest so I knew it wasn't hard. 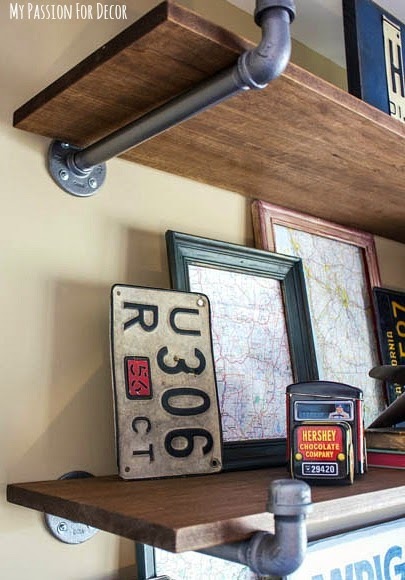 I used the same wood shelves I bought from IKEA for my DIY pipe shelving. Then I purchased all my pipes from Home Depot. I didn't need any of the pipes cut this time. I used plumbing pipes and they came in exactly the size I needed. The shelves are very easy to assemble. First thing I did was attach the floor flanges to the wall. I figured out where I wanted the shelves on the wall and how far apart the flanges needed to be. I screwed the pipe to the floor flange, then attached the elbow to the other end of the pipe. Lastly I screwed on the pipe cap on the end of the elbow. 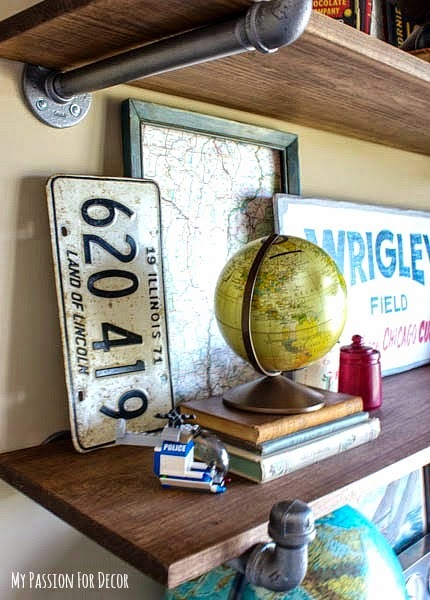 The wood shelf fits perfectly on the pipes and the pipe cap keeps the shelf on tightly. I stained the wood in my favorite dark walnut stain and then finished it off with a couple coats of wipe on poly. They were that easy to make! Here are the finished shelves in Hunter's room. We made sure we found studs in the walls, then screwed the flanges into the studs. They're very sturdy and can be used for years to come. A few comments about the things on his shelves. The Hunter license plate sign I purchased at the Country Living Fair last summer. 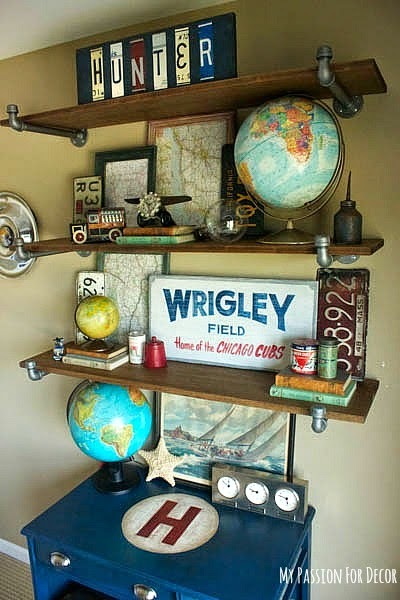 This would be an easy and inexpensive DIY project. Tin snips and some license plates, then attach the plates with nails to a simple painted board and there you have it!! The picture frames with maps are from a previous post I wrote about his room I decorated in CT. You can see more details here. These are SUPER inexpensive to make. I got the frames at a local thrift store and some vintage gas station maps and attached the maps to the frames using a staple gun. I spent about a $1 for each one. The license plates I've been collecting over the last few years for his room. The most I've ever spent was $7 for a license plate. Some I've bought for as little as $1. I purchased most of them at yard sales, flea markets and estate sales. 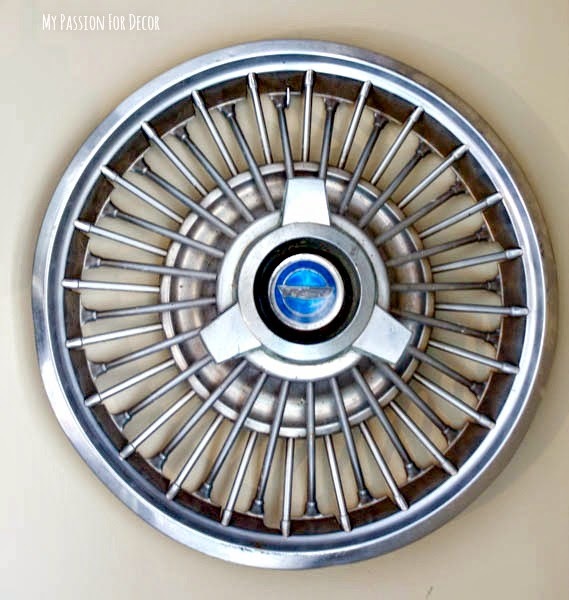 The hub caps, Hunter picked out at an estate sale last fall. They were $5 each. 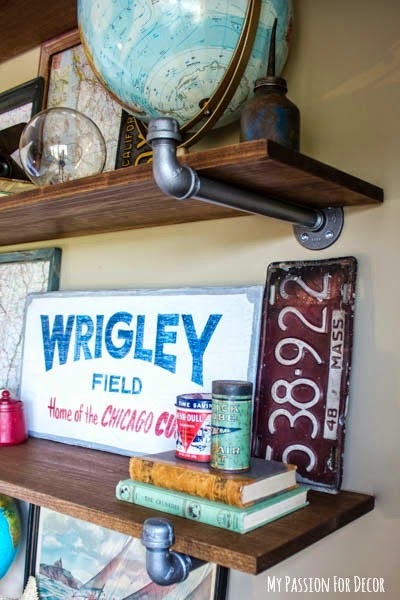 The most expensive item on the shelves is the hand painted Wrigley Field sign. I bought that at a local flea market for $25. The globes are part of my collection. 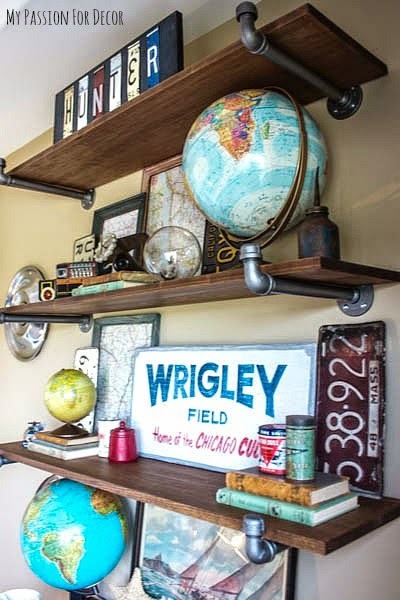 My favorite globe is on his desk. He has 2 light up globes in his room that he uses at night. I love them!! Hunter likes to add things to the shelves from time to time...Last week, he added this little helicopter he built out of Lego. The little Hershey Chocolate truck tin is from Goodwill and it was $.50! One of my favorite things on the shelves is that large vintage light bulb. I bought that for $3 at an estate sale awhile back. I like how unexpected it is. The newest addition to his room, is the number 9. It's a big plastic number that was used in a store display. The hubby and I bought it for him at an antique while we were in Nashville. For curtains in Hunter's room I used IKEA curtains. Normally I'm not a fan of grommets on curtains, but these were fun and the perfect color for a kids room. 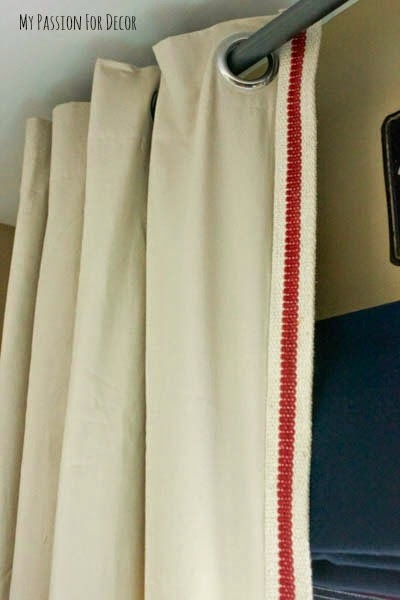 I sewed on some red and cream trim to the inside edge of the curtains to give them a custom look. 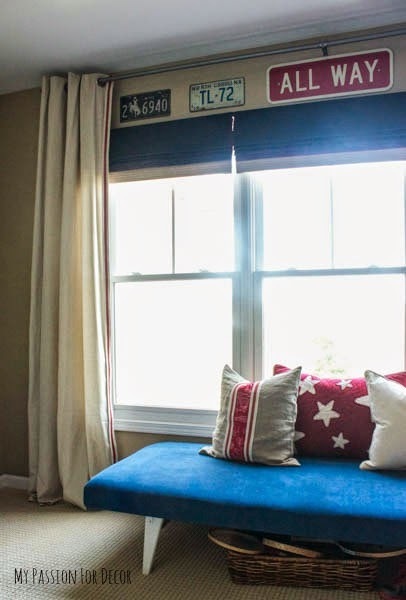 The window in Hunter's room is long and the curtain rods I had from his previous room were too small. I needed a long rod and didn't want to pay a lot so, I used electrical conduit piping, two pipe elbows and 2 flanges. The whole rod cost $25 to make....much cheaper than a long curtain rod from a store. I added a curtain rod bracket in the middle for support, then I sprayed all the pieces a brushed nickel. I hung more license plates and an ALL WAY sign above his window to tie everything together. The day bed, I found free on the side of the road a couple summers ago. I had stripped it down and upholstered it for my office a few houses ago, but thought it would fit perfectly in front of Hunter's window. I reupholstered it in denim fabric and now it's a great place to sit and read a book. There's a nice view of the pond and all the birds that live there. 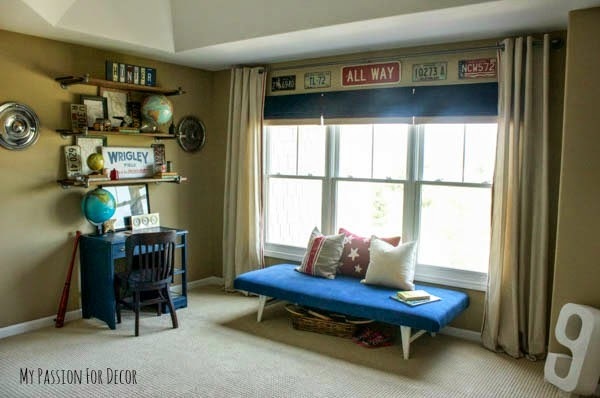 Decorating a room for yourself or your child is easy. All it takes are pieces that have meaning. Nothing in these pictures was expensive. The desk was free, given to me by a friend...I just painted it and gave it new life with some maps (you can read more about that here.) The solid wood library chair was an estate sale purchase for $10. The art on the desk was $5 at an estate sale, the clocks were $5 from Goodwill. You don't have to spend a fortune to make a room special. Overall, I wanted this room to feel collected. I think it looks collected because I didn't go to one store and buy everything at one time. It's possible to go out and buy everything you need for a room at one store, but it's a lot harder to get a unique look that's all your own. This room reflects Hunter's personality and interests and that's what makes this room special....also the kiddo who sleeps in this room! Figure out what you love and see what you have around the house. 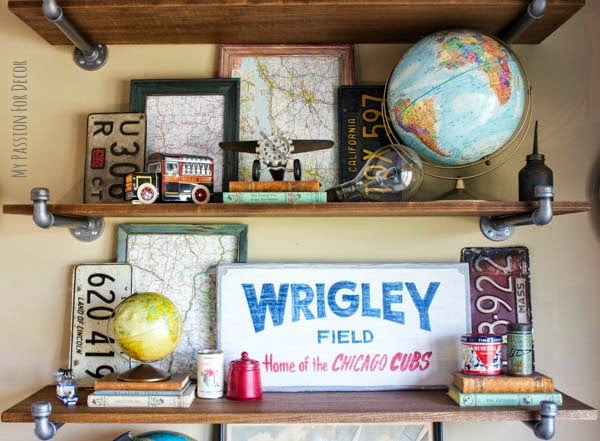 Maybe you have a collection that you have spread out in several rooms. 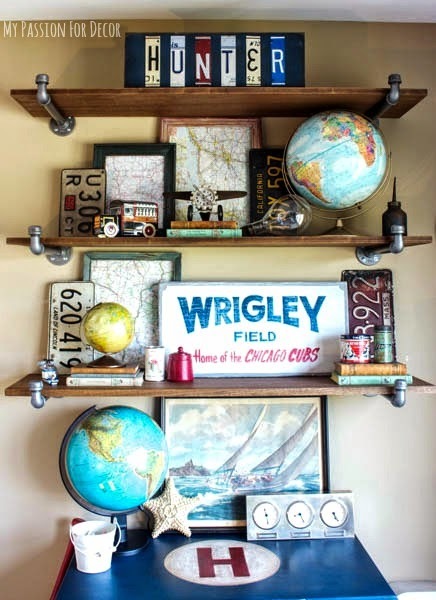 Bring that collection together and display it in a room you spend a lot of time in. There are no hard and fast rules for decorating...there might be some out there who don't agree. I feel like a room needs to be a reflection of who lives in and uses the room. If that is achieved, then it's a success. 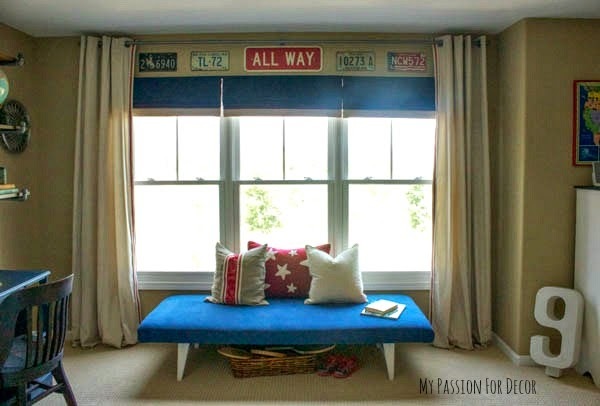 I hope this post has helped inspire you to decorate your child's room or even one of your own. I let Hunter read the top portion of this post before I was finished writing. I wanted to see what he thought. It was wonderful to watch his facial expressions as he read what I wrote about him and our joy when he became part of the family. He smiled from ear to ear. Who doesn't want to read about how special and loved they are?! In the end....this is all just stuff. The stuff will come and go. The stuff isn't important, it's the people and the memories made that something. what an awesome room and an even more awesome story. So happy for the wonderful miracle of your boy. So happy that you have someone to share that dimpled chin with. 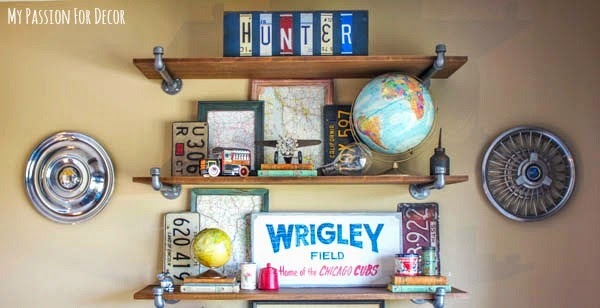 Love the room, especially that Wrigley Field sign! (Worth every penny.) And isn't it amazing how God knows exactly what we need, exactly when we need it? He is a lucky boy and you are a lucky mom!! Thanks so much Kirby....so true! 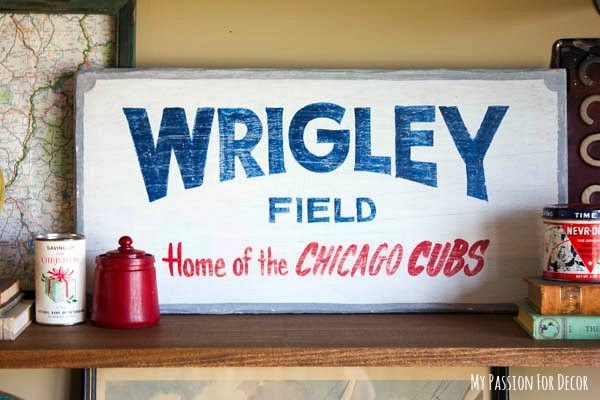 :-) And yes that Wrigley Field sign is awesome, right?! I want to go back to the flea market and buy some of their other signs. The couple who make them are an older couple and so sweet. The man paints them all by hand. He used to own a sign company so he's the real deal. I feel like it's a piece of art! Awesome room for an awesome kid. Good job on the room and great job with Hunter! You are one awesome mama! 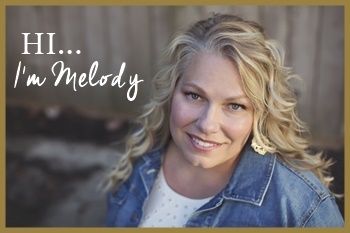 Melody - so nice to get a little piece of your heart along with this post - I always love to see what you put together - it always looks fantastic! It is posts like this that make you and other bloggers real people to the rest of us. Thanks for sharing such personal information. BTW, I'm lovin' Hunter's room. Great palette. Such a great story Mel! Hunters room is absolutely perfect! You have such a flair for decorating! Your story is awesome and the room is beautiful and special, as I'm sure Hunter is too! I relate so much with your story, as my husband and I were also infertility patients. Thankfully, God did finally bless us with two beautiful miracle boys (both in vitro babies). Thank you so much for sharing your story and Hunter 's room. 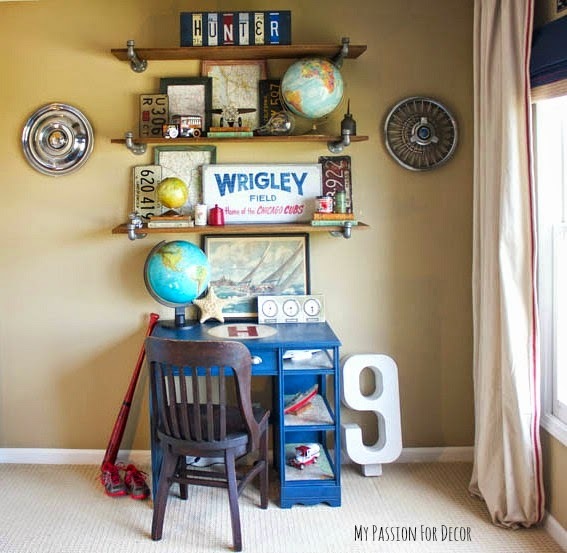 I will definitely be trying these shelves...they are so perfect for a boy's room! Thank you Storybooker! 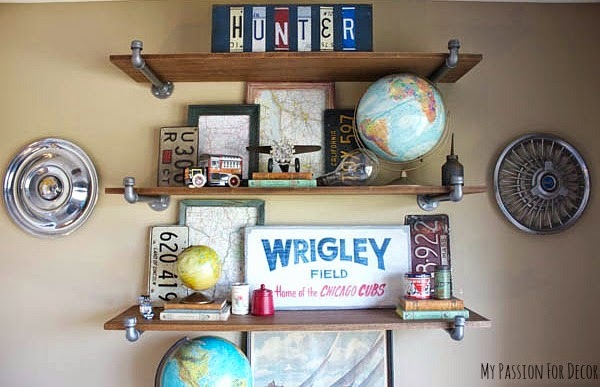 These shelves are so easy and they really look cool . You're pretty wonderful. I love your heart. You're a pretty great decorator, too. Hunter's room would thrill any 9 year old!